SANDVIK has announced an innovative, all-new welding app which was launched on its stand at Tube 2016 specifically designed with on-the-job functionality to meet welding professionals’ requirements when planning and performing welding projects. Sandvik welding specialists demonstrated the features of the app and answered visitors’ questions. 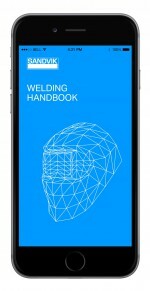 The new welding app, Sandvik Welding, is available and free to download for phones and tablets from the App store for Apple and Google.play for android devices. Sandvik says built with ease of navigation, the new app brings extensive information to hand for welding engineers, welders, specifiers, project engineers and owner operators and brimming with useful technical data it allows users to plan which grades to choose for which jobs, make ferrite calculations, determine the level of heat input for a specific grade and select filler material.